Pittsburg Parks & Recreation Department will host their 9th Annual Holiday Craft Fair & Santa’s Workshop this Saturday, December 2, in the lower level of Memorial Auditorium & Convention Center, 503 N. Pine St., Pittsburg. The Holiday Craft Fair, which runs from 8:00 am – 12:00 pm, features a variety of holiday vendors selling artisan and handmade crafts. This craft fair provides a one-stop shop for those needing one-of-a-kind holiday gifts for family and friends. Santa’s Workshop, which takes place from 9:00 am – 12:00 pm, offers children an opportunity to enjoy hands-on holiday activities while parents and grandparents shop for gifts. 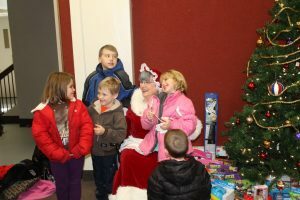 Kids can decorate ornaments, color pictures, play games and even enjoy a special guest visit from Santa Claus. All children must have adult supervision while in the workshop. By participating in these events, shoppers can also give to those in need. Admission for both the Holiday Craft Fair & Santa’s Workshop is one non-perishable unexpired food donation to Wesley House, which helps individuals who are underserved in Crawford County. To find out more, call Pittsburg Parks & Recreation Department at (620) 231-8310, or email sara.vacca@pittks.org.